With the possibility of sale of excess electric energy generated by mills, Renuka do Brasil has invested in higher pressure boilers and higher potency turbo generators, in order to take maximum advantage of the thermal power of bagasse. Therefore, it is necessary to achieve the highest efficiency in the thermal cycle of the production process, in a way that maximizes availability of steam for generation of electric energy. 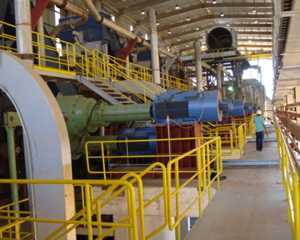 The electrification of mills fulfills exactly the intention of reducing vapor consumption in the milling of cane, employing a set of electric motors and highly efficient frequency inverters to replace conventional steam driven turbines in the mill's crushers. Beyond the reduction of steam consumption and higher efficiency, the electrification of mills also brings other advantages intrinsic to the technology: greater productivity, extraction of a larger quantity of juice using the same crusher, more control of the process because of flexibility in velocity of the mill, remote operation which reduces risk of accidents, compact and reduced installation, smooth starts and stops free of mechanical 'jerks', besides providing a clean and safe installation. Mill Revati was inaugurated in 2008 with a totally electrified mill, beginning with preparation up to and including all five crushers. The installed potency of each crusher is more than 3,000 cv.